The Epistle to the Galatians, often shortened to Galatians, is the ninth book of the New Testament. It is a letter from Paul the Apostle to a number of Early Christian communities in Galatia. Scholars have suggested that this is either the Roman province of Galatia in southern Anatolia, or a large region defined by an ethnic group of Celtic people in central Anatolia. Paul is principally concerned with the controversy surrounding Gentile Christians and the Mosaic Law during the Apostolic Age. Paul argues that the Gentile Galatians do not need to adhere to the tenets of the Mosaic Law, particularly circumcision, by contextualizing the role of the law in light of the revelation of Christ. Galatians has exerted enormous influence on the history of Christianity, the development of Christian theology, and the study of the apostle Paul. No original of the letter is known to survive. The earliest reasonably complete version available to scholars today, named P46, dates to approximately 200 AD, approximately 150 years after the original was presumably drafted. This papyrus is fragmented in a few areas, causing some of the original text to be missing, "however, through careful research relating to paper construction, handwriting development, and the established principles of textual criticism, scholars can be rather certain about where these errors and changes appeared and what the original text probably said." A majority of scholars agree that Galatians was written between the late 40s and early 50s, although some date the original composition to c. 50–60 AD. Biblical scholars agree that Galatians is a true example of Paul's writing. The main arguments in favor of the authenticity of Galatians include its style and themes, which are common to the core letters of the Pauline corpus. George S. Duncan described the authenticity of Paul as its author as "unquestioned... In every line it betrays its origin as a genuine letter of Paul." Moreover, Paul's possible description of the Council of Jerusalem (Gal.2:1–10) gives a different point of view from the description in Acts 15:2–29, if it is, in fact, describing the Jerusalem Council. The central dispute in the letter concerns the question of how Gentiles could convert to Christianity, which shows that this letter was written at a very early stage in church history, when the vast majority of Christians were Jewish or Jewish proselytes, which historians refer to as the Jewish Christians. Another indicator that the letter is early is that there is no hint in the letter of a developed organization within the Christian community at large. This puts it during the lifetime of Paul himself. Nevertheless, a small number of scholars have questioned Paul's authorship of Galatians, such as Bruno Bauer, Abraham Loman, C. H. Weisse and Frank R. McGuire. Paul's letter is addressed "to the churches of Galatia" (Galatians 1:2), but the location of these churches is a matter of debate. A minority of scholars have argued that the "Galatia" is an ethnic reference to a Celtic people living in northern Asia Minor, but most agree that it is a geographical reference to the Roman province in central Asia Minor, which had been settled by immigrant Celts in the 270s BC and retained Gaulish features of culture and language in Paul's day. Acts of the Apostles records Paul traveling to the "region of Galatia and Phrygia", which lies immediately west of Galatia. Some[who?] claim the New Testament says that the churches of Galatia (Antioch of Pisidia, Iconium, Lystra and Derbe) were founded by Paul himself (Acts 16:6; Galatians.1:8;4:13;4:19). They seem to have been composed mainly of gentile converts (Galatians 4:8). After Paul's departure, the churches were led astray from Paul's trust/faith-centered teachings by individuals proposing "another gospel" (which centered on salvation through the Mosaic law, so-called legalism), whom Paul saw as preaching a "different gospel" from what Paul had taught (Galatians 1:1–9). The Galatians appear to have been receptive to the teaching of these newcomers, and the epistle is Paul's response to what he sees as their willingness to turn from his teaching. The identity of these "opponents" is disputed. However, the majority of modern scholars view them as Jewish Christians, who taught that in order for converts to belong to the People of God, they must be subject to some or all of the Jewish Law, (i.e. Judaizers). The letter indicates controversy concerning circumcision, Sabbath observance, and the Mosaic Covenant. It would appear, from Paul's response, that they cited the example of Abraham, who was circumcised as a mark of receiving the covenant blessings (Genesis 17). They certainly appear to have questioned Paul's authority as an apostle, perhaps appealing to the greater authority of the Jerusalem church governed by James (brother of Jesus). The North Galatian view holds that the epistle was written very soon after Paul's second visit to Galatia (Acts 18:23). In this view, the visit to Jerusalem, mentioned in Galatians 2:1–10, is identical with that of Acts 15, which is spoken of as a thing of the past. Consequently, the epistle seems to have been written after the Council of Jerusalem. The similarity between this epistle and the epistle to the Romans has led to the conclusion that they were both written at roughly the same time, during Paul's stay in Macedonia in roughly 56–57. This third date takes the word "quickly" in Gal. 1:6 literally. John P. Meier suggests that Galatians was "written in the middle or late 50s, only a few years after the Antiochene incident he narrates". Eminent Biblical scholar Helmut Koester also subscribes to the "North Galatian Hypothesis". Koester points out that the cities of Galatia in the north consist of Ankyra, Pessinus, and Gordium (of the Gordian Knot fame of Alexander the Great). The South Galatian view holds that Paul wrote Galatians before or shortly after the First Jerusalem Council, probably on his way to it, and that it was written to churches he had presumably planted during either his time in Tarsus (he would have traveled a short distance, since Tarsus is in Cilicia) after his first visit to Jerusalem as a Christian, or during his first missionary journey, when he traveled throughout southern Galatia. If it was written to the believers in South Galatia, it would likely have been written in 49. A third theory is that Galatians 2:1–10 describes Paul and Barnabas' visit to Jerusalem described in Acts 11:30 and 12:25. This theory holds that the epistle was written before the Council was convened, possibly making it the earliest of Paul's epistles. According to this theory, the revelation mentioned (Gal 2:2) corresponds with the prophecy of Agabus (Acts 11:27–28). This view holds that the private speaking about the gospel shared among the Gentiles precludes the Acts 15 visit, but fits perfectly with Acts 11. It further holds that continuing to remember the poor (Gal. 2:10) fits with the purpose of the Acts 11 visit, but not Acts 15. In addition, the exclusion of any mention of the letter of Acts 15 is seen to indicate that such a letter did not yet exist, since Paul would have been likely to use it against the legalism confronted in Galatians. Finally, this view doubts Paul's confrontation of Peter (Gal. 2:11) would have been necessary after the events described in Acts 15. If this view is correct, the epistle should be dated somewhere around 47, depending on other difficult to date events, such as Paul's conversion. Kirsopp Lake found this view less likely and wondered why it would be necessary for the Jerusalem Council (Acts 15) to take place at all if the issue were settled in Acts 11:30/12:25, as this view holds. Defenders of the view do not think it unlikely an issue of such magnitude would need to be discussed more than once. Renowned New Testament scholar J.B. Lightfoot also objected to this view since it "clearly implies that his [Paul's] Apostolic office and labours were well known and recognized before this conference." Defenders of this view, such as Ronald Fung, disagree with both parts of Lightfoot's statement, insisting a) Paul received his "Apostolic Office" at his conversion (Gal. 1:15–17; Acts 9). Fung holds, then, that Paul's apostolic mission began almost immediately in Damascus (Acts 9:20). While accepting that Paul's apostolic anointing was likely only recognized by the Apostles in Jerusalem during the events described in Galatians 2/Acts 11:30, Fung does not see this as a problem for this theory. Valentin de Boulogne's depiction of "Saint Paul Writing His Epistles", 16th century (Blaffer Foundation Collection, Houston, Texas). Lightfoot notes with respect to verse 6:11 that at this point "the apostle takes the pen from his amanuensis, and the concluding paragraph is written with his own hand". The citation here is based on the content of the gospel. Alternative outlines have been introduced based on the rhetorical form of the letter. This epistle addresses the question of whether the Gentiles in Galatia were obligated to follow Mosaic Law to be part of the Christ community. After an introductory address (Galatians 1:1–10), the apostle discusses the subjects which had occasioned the epistle. In the first two chapters, Paul discusses his life before Christ and his early ministry, including interactions with other apostles in Jerusalem. This is the most extended discussion of Paul's past that we find in the Pauline letters (cf. Philippians 3:1–7). Some have read this autobiographical narrative as Paul's defense of his apostolic authority (1:11–19; 2:1–14). Others, however, see Paul's telling of the narrative as making an argument to the Galatians about the nature of the gospel and the Galatians' own situation. Chapter 3 exhorts the Galatian believers to stand fast in the faith as it is in Jesus. Paul engages in an exegetical argument, drawing upon the figure of Abraham and the priority of his faith to the covenant of circumcision. Paul explains that the law was introduced as a temporary measure, one that is no longer efficacious now that the seed of Abraham, Christ, has come. Chapter 4 then concludes with a summary of the topics discussed and with the benediction, followed by 5:1–6:10 teaching about the right use of their Christian freedom. "At this point the apostle takes the pen from his amanuensis, and the concluding paragraph is written with his own hand. From the time when letters began to be forged in his name (2Thessalonians 2:2; 2Thessalonians 3:17) it seems to have been his practice to close with a few words in his own handwriting, as a precaution against such forgeries... In the present case he writes a whole paragraph, summing up the main lessons of the epistle in terse, eager, disjointed sentences. He writes it, too, in large, bold characters (Gr. pelikois grammasin), that his hand-writing may reflect the energy and determination of his soul." Alternatively, some commentators have postulated that Paul's thorn in the flesh was poor eyesight, which caused him to write in characteristically large letters. Galatians also contains a catalogue of vices and virtues, a popular formulation of ancient Christian ethics. Probably the most famous single statement made in the Epistle, by Paul, is in chapter 3, verse 28: "There is neither Jew nor Gentile, neither slave nor free, nor is there male and female, for you are all one in Christ Jesus." The debate surrounding that verse is legend and the two schools of thought are (1) this only applies to the spiritual standing of people in the eyes of God, it does not implicate social distinctions and gender roles on earth; and (2) this is not just about our spiritual standing but is also very much about how we relate to each other and treat each other in the here and now. Position (1) emphasises the immediate context of the verse and notes that it is embedded in a discussion about justification: our relationship with God. Position (2) reminds its critics that the "whole letter context" is very much about how people got on in the here and now together, and in fact the discussion about justification came out of an actual example of people treating other people differently (2:11ff). As Canadian religious historian Barrie Wilson points out in How Jesus Became Christian, Paul's Letter to the Galatians represents a sweeping rejection of Jewish Law (Torah). In so doing Paul clearly takes his Christ movement out of the orbit of Judaism and into an entirely different milieu. 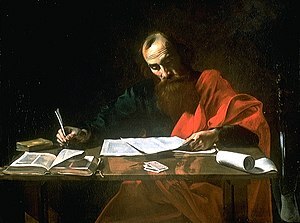 Paul's stance constitutes a major contrast to the position of James, brother of Jesus, whose group in Jerusalem adhered to the observance of Torah. Many scholars question whether Paul's view dovetails with Jesus' own teachings concerning the Law. ^ a b c Betz, H. D. (2007). "Galatians, Epistle to the". Yale Anchor Bible Dictionary. Yale University Press. ISBN 978-0300140811. ^ Riches, John (2007). Galatians Through the Centuries. Wiley-Blackwell. ISBN 978-0631230847. ^ Ehrman, Bart (2005). Misquoting Jesus: The Story Behind Who Changed the Bible and Why. San Francisco: Harper. p. 60. ISBN 0-06-073817-0. ^ Metzger, Bruce M. (1994). A Textual Commentary on the New Testament (2nd ed.). United Bible Societies. pp. 1–16. ISBN 3-438-06010-8. ^ M. Coogan, ed. The New Oxford Annotated Bible (Oxford University Press: New York, 2001), 309 NT. ^ "Galatians". Early Christian Writings. ^ Duncan, George S. (1934). The Epistle of Paul to the Galatians. London: Hodder and Stoughton. pp. xviii. ^ a b c Holladay, Carl R. (2005). A Critical Introduction to the New Testament. Nashville, TN: Abingdon Press. pp. 463–66. ISBN 978-0687085699. ^ Longenecker, Richard (2015). Galatians. Zondervan. p. lviii. ISBN 978-0310521945. ^ a b c McDonald, Lee Martin (2004). "Introduction to Galatians". In Evans, Craig (ed.). The Bible Knowledge Background Commentary: Acts–Philemon, Volume 2. Colorado Springs, CO: Victor. p. 462. ISBN 9780781440066. ^ Brown, Raymond E.; Meier, John P. (1983). Antioch & Rome: New Testament Cradles of Catholic Christianity. New York: Paulist Press. p. 113. ISBN 9780809125326. ^ Fung, Ronald Y. K. (1988). The Epistle to the Galatians. Grand Rapids, MI: Eerdman's Press. pp. 16–22. ISBN 0-8028-2509-5. See also "New Testament Study Helps: Galatians". Theology WebSite. ^ a b c d Fung, Ronald Y. K. (1988). The Epistle to the Galatians. Grand Rapids, MI: Eerdman's Press. p. 19. ISBN 0-8028-2509-5. ^ Lake, Kirsopp (1933). ""The Apostolic Council of Jerusalem". In Foakes Jackson, F. J.; Lake, Kirsopp (eds.). The Beginnings of Christianity, Volume 5. London: Macmillan. p. 201. ^ Marshall, I.H. (1980). The Acts of the Apostles. Grand Rapids: Tyndale New Testament Commentaries. p. 205. ^ Lightfoot continues, "From the time when letters began to be forged in his name (2 Thessalonians 2:2; 2 Thessalonians 3:17) it seems to have been his practice to close with a few words in his own handwriting, as a precaution against such forgeries... In the present case he writes a whole paragraph, summing up the main lessons of the epistle in terse, eager, disjointed sentences. He writes it, too, in large, bold characters (Gr. pelikois grammasin), that his handwriting may reflect the energy and determination of his soul." Joseph Barber Lightfoot, Commentary on the Epistle to the Galatians. ^ Betz, H. D. (2007). "Paul". Yale Anchor Bible Dictionary. Yale University Press. ISBN 978-0300140811. ^ Holladay, Carl R. (2005). A Critical Introduction to the New Testament. Nashville, TN: Abingdon Press. pp. 466–67. ^ Barclay, John M. G. (2002). "Paul's Story: Theology as Testimony". In Longenecker, Bruce W. (ed.). Narrative Dynamics in Paul. Louisville, London: Westminster John Knox. pp. 133–56. ISBN 0-664-22277-3. ^ Lightfoot, J.B. (1865). St. Paul's Epistle to the Galatians. Cambridge: Macmillan. pp. 211–12. ^ Galatians (revised ed.). Tyndale New Testament Commentary. p. 233. ^ Pate, C. Marvin (2000). The Reverse of the Curse: Paul, Wisdom, and the Law. Mohr Siebeck. p. 181. ISBN 9783161472862. ^ a b For an overview of the two theories see Reiher, Jim (March 2012). "Galatians 3: 28 – Liberating for women's ministry? Or of limited application?". The Expository Times. 123 (6): 272–277. doi:10.1177/0014524611431773. Reiher comes down on the side of position (2). ^ Wilson, Barrie (2008). How Jesus Became Christian. New York: St. Martin's Press. This article incorporates text from a publication now in the public domain: Easton, Matthew George (1897). "Galatians, Epistle to the" . Easton's Bible Dictionary (New and revised ed.). T. Nelson and Sons. Chisholm, Hugh, ed. (1911). "Galatians, Epistle to the" . Encyclopædia Britannica (11th ed.). Cambridge University Press.